Published By – TRO-Cheshire Music, Inc. 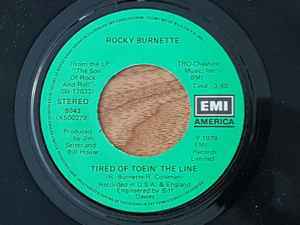 This release has a label variation, on this one does not have Side 1 or Side 2 above Rocky Burnette. One of the other listed has Side 1 above Rocky Burnette at the top of the label for side 1 but nothing is at the top of Rocky Burnette on side 2. One of the other ones listed has the exact opposite of this. This label also has TRO-Cheshire Music, Inc. BMI above time on both sides. The other labels have it on just one side.